Sarah Schulman, Susan Abulhawa, Aja Monet and Radhika Sainath at Verso Books in Brooklyn, September 18, 2017. Join writers Susan Abulhawa and Sarah Schulman, poet Aja Monet, and legal expert Radhika Sainath as they discuss the repression of Palestinian cultural production as well as the increasingly harsh attempts here in the United States to silence criticism of Israeli government policies. “Free (Speech) Palestine” continues the conversation about solidarity and the role of the artist that was sparked by the campaign calling on PEN America to reject Israeli government sponsorship for its World Voices Festival. 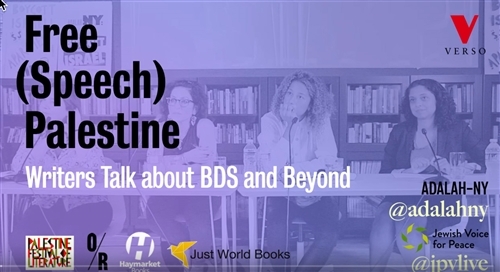 The evening’s conversation will address the conditions under which Palestinian artists labor, the Palestinian call for the cultural boycott of Israel, and efforts to criminalize BDS (boycott, divestment, and sanctions) in the United States. Organized by Adalah-NY: Campaign for the Boycott of Israel and Jewish Voice for Peace: Arts & Culture.